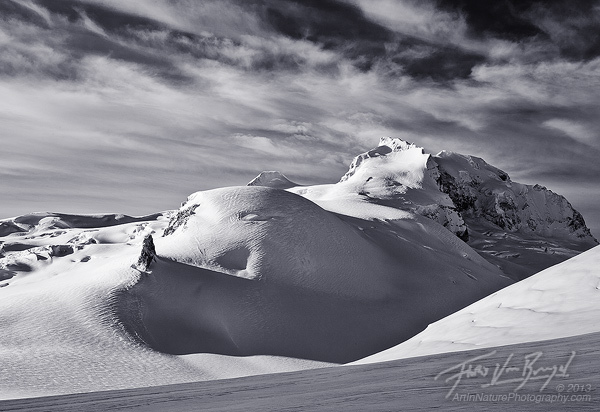 The silence and purity of an alpine glacial landscape in winter is unlike any other place I’ve ever seen. Ice and snow extend as far as the eye can see. Not a single living soul – animal, tree, or human – is visible for miles. Not even a trace. Being the only living thing for as far as the eye can see is an inexplicably invigorating feeling. Somehow it makes you feel even more alive, as if you have to make up for the lack of life around you. And yet the cold air, and your exhausted muscles work against you, trying to freeze your body in place just like the rest of the landscape. Unfortunately these are feelings most people will never experience. 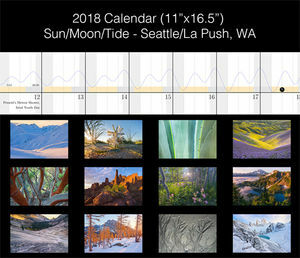 Hopefully these images are able to transport you to that place for just a brief moment of time, and maybe someday you will have the opportunity to stand there yourself. Aubrey amid the endless landscape of snow and ice of the Garibaldi Neve Glacier in British Columbia’s Garibaldi Provincial Park. For this experience, last week my girlfriend Aubrey and I spent 3 days ski touring in British Columbia’s Garibaldi Provincial Park. 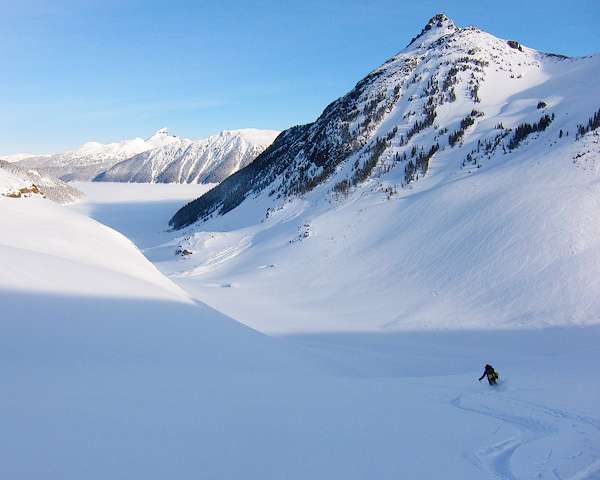 The initial plan was to ski the classic Garibaldi Neve traverse, however due to avalanche concerns and potentially inclement weather (which would lead to a whiteout on the glacier) we decided to just do the first half. After 11km of skinning up switchbacks through a steep forest we finally reached the frozen Garibaldi Lake, a seemingly endless (7km in reality) slog. But with spectacular views in every direction and soft powdery snow underfoot, the only real difficulty was that we’d brought a rather small bag of trail mix. 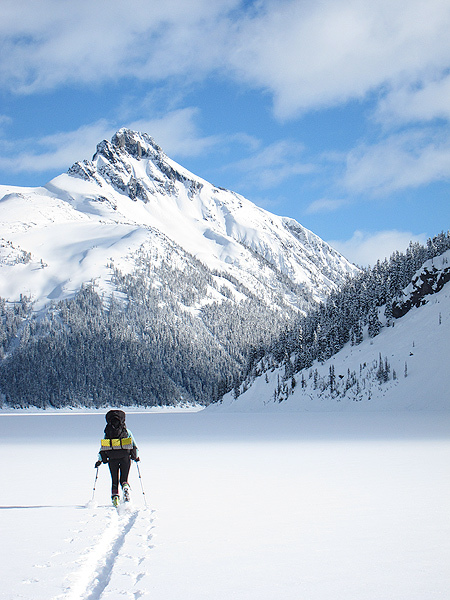 Aubrey skiing across Garibaldi Lake, with Guard Mountain in the background. At last we reached our resting point for the day, the base of the Sentinel Glacier. From here we had spectacular views of the Black Tusk across Garibaldi Lake. The lingering afternoon clouds danced in the setting sunlight as we heated our homemade freeze-dried curry (from a year and a half ago). By 7pm we were fast asleep. Soft evening light on the imposing Black Tusk above Garibaldi Lake in British Columbia’s Garibaldi Provincial Park. At 4am the alarm went off, and we worked up the courage to crawl out of our frosted tent and into the starry night. After a quick breakfast of warm cheesy grits (we forgot the bacon bits – needless to say, that was a huge disappointment), we set out in the darkness, guided by the half moon, a GPS, and my 500 lumen spotlight. 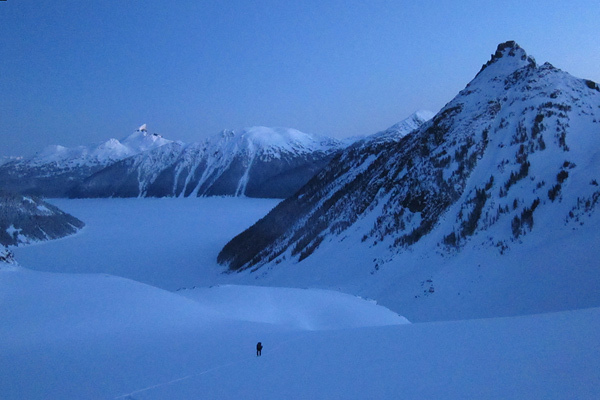 Our goal was to get to the beginning of the Garibaldi Neve to watch the sunrise. 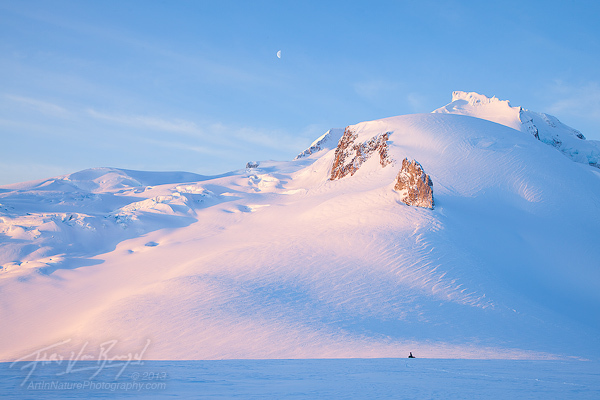 Aubrey skinning above Garibaldi Lake, an hour before sunrise. After an hour and a half of climbing, we finally entered the realm of the alpine glaciers. Dawn was breaking, and soon a pink glow spread across the endless expanse of snow and ice. It was magical. And cold. I was too excited about the views to look at my thermometer, but down at camp it was 10° F, so up on the glacier it was probably close to 3° F (assuming approximately 5° F temperature change per 1,000 feet). 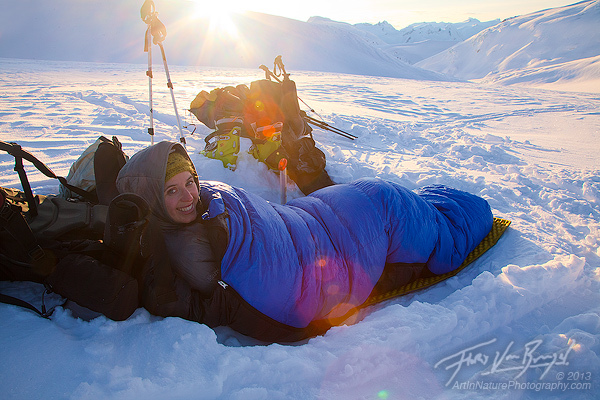 While I was out exploring and taking photographs, Aubrey enjoyed the views from the warmth of her sleeping bag. Those first rays of sun were a most welcome warmth in the frozen landscape! 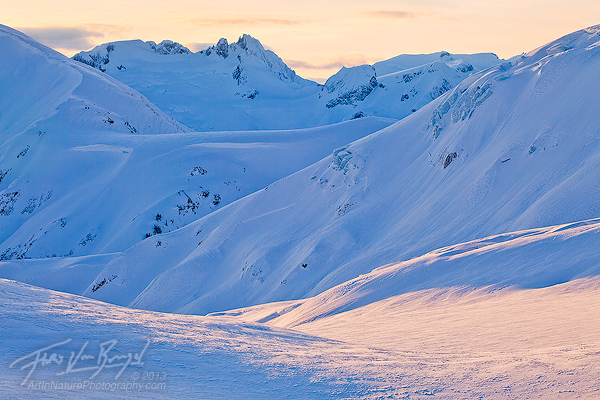 First light on the Garibaldi Neve with endless views of the frozen winter mountains of British Columbia. Aubrey enjoying her sleeping bag view. 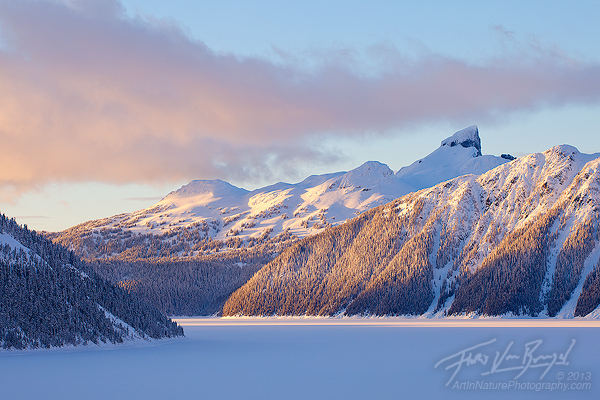 Late morning light on Mount Garibaldi in British Columbia’s Garibaldi Provincial Park. Satisfied, we began making our way back. The clouds were already beginning to roll in. Someday we’ll come back and finish the traverse when we don’t have to worry about avalanches and whiteouts. The cold snow made for some good skiing back to our camp, where we crawled back in the tent for a much needed nap! Aubrey makes some turns on the way back to camp. For our second night we moved camp to the other side of Garibaldi Lake, with a great view of Mount Price. Apparently in the summer time this place is crawling with tourists who come here to ooh and ahh at the turquoise waters and glaciated peaks. It’s hard to imagine how different it must look then compared to the snowy solitude we had. My cozy winter tent, illuminated in the waning twilight hours on the shores of frozen Garibaldi Lake with a view of Mount Price in the background. Aubrey illuminated the tent from the inside during the 30 second exposure. Unfortunately we arrived back at the car to find the passenger window smashed in and a bag of clothes and Aubrey’s (insured) phone missing. Fortunately the thieves didn’t bother taking all of our cans of coconut water, though they did steal a half empty box of poptarts. Lesson learned: humans in the winter are just as bad as bears in the summer. Sweeeet trip!! Frozen Forever is awesome, I also dig the Winter Palace. 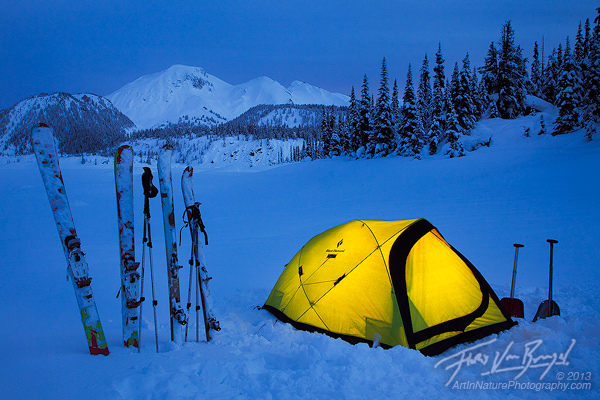 The obligatory winter tent shots are so fun… Those looks like awesome mountains around there. Thanks Jack! You should start planning a trip to BC.. there are so many mountains to explore in winter or summer that you could spend years and never repeat a route! That’s an incredible journey, and being in the wild of snowy land seems a sweet dream in real life. Looks like a great adventure Floris. The accompanying photographs are delightful. I especially love the human element you have provided to this landscape by including Aubrey in the compositions. I love your photographs at this places. They transports me to that place for a brief moment of time. Thank you!